Warm and welcoming, from the wide front porch to the gracious foyer flanked by a large dining-room and huge living-room. A grand home perfect for today's living. Kitchen and baths are updated, conversion to gas heat and new central air, done! Host the holidays, invite a crowd and entertain formally, or spend cozy winter family nights by the the fireplace or warm summer nights on the porch, this home welcomes you with open arms. A large master suite with master bath,dressing room and adjacent study is the perfect adult hideaway. Four additional bedrooms and two full baths, a family room and mudroom off the kitchen space for everyone! An amazing location,stroll for coffee and a pastry in the morning or several nearby restaurants for lunch or dinner. 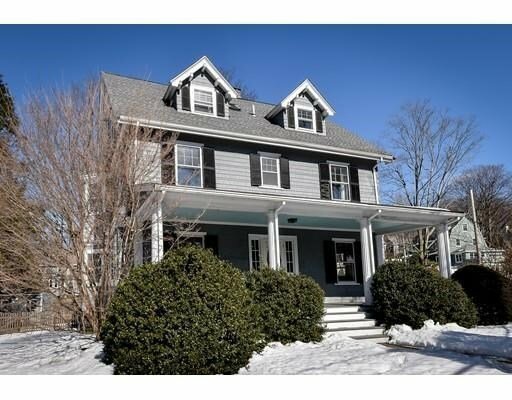 A short walk to the commuter rail or hop on the highway to Boston,Cambridge the Seaport or Logan Airport. You can feel it when you walk in...you are home!